This is my third annual “Top CAD Blogs” post! Just like last year, I’ve lumped all different “flavors” of CAD blogs (AutoCAD vs. Revit vs. Inventor vs. etc.) together. I also eliminated blogs that were inactive or highly commercial. 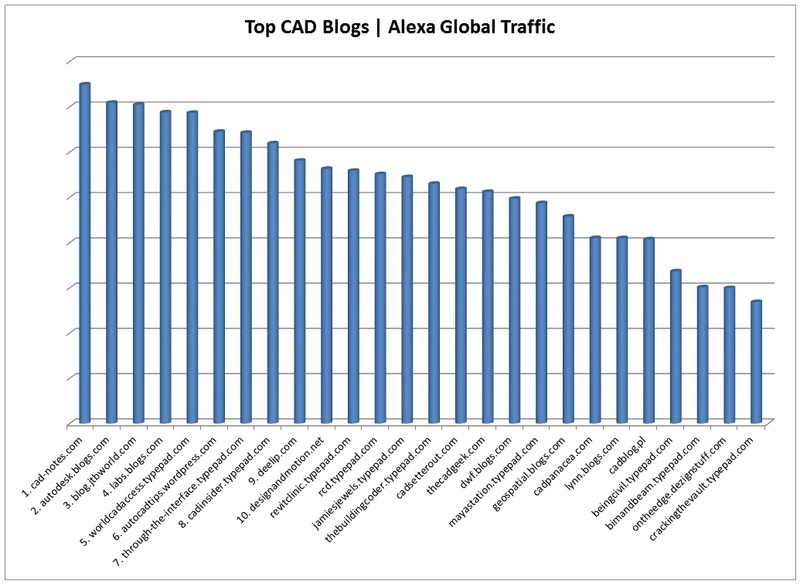 Once again I ranked the top CAD blogs according to Alexa’s Global Traffic Rank. Alexa explains that their traffic rank is a measure of a site’s popularity. The rank is calculated using a combination of average daily visitors and page views over the past 3 months. The site with the highest combination of visitors and page views is ranked #1. Were websites that were structured primarily as a CAD blog. I considered seventy (70) blogs, and listed them in table format below. The two charts that I’ve included display the top twenty five (25) blogs. Here’s the pie chart of the top 25. Here’s the bar chart of the top 25. 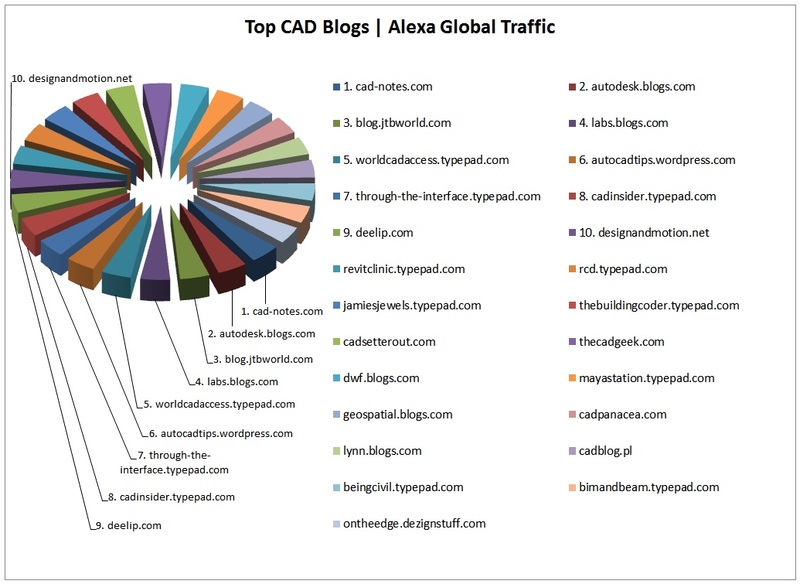 This year the competition for the top CAD blog was a good one. There is a new king, and the battle for position #2 became a tight one. Let’s congratulate Edwin Prakoso for his impressive move to the position of the #1 CAD Blog with his blog http://www.cad-notes.com!! Congrats Edwin!! And as I mentioned, there was a close race for position #2, between last year’s first and second place holders. This year Jimmy Bergmark was hot on the heels of Shaan Hurley. Congrats to Shaan though, because he pulled out second place with his blog http://autodesk.blogs.com/. Way to go Shaan!! And congrats to Jimmy, for securing third place with his blog http://blog.jtbworld.com!! If I’ve missed your website, then my apologies! Please leave your site in the comments below, and I’ll include it the next time around. Great post. Could be interesting a similar article with the twitter accounts. SolidWorks Legion global rank is around 1.5Mth. In fact, I would suggest you are missing quite a number of SolidWorks blogs. The Blogs.dot.SolidWorks.dot.com site is just a bit over 22,000 ranking worldwide. Thanks for the heads-up! …At this point, I ask for submissions in order to be considered in my list. The world of CAD blogging has gotten so large, that fishing the web for blogs to include would be a task larger than I have time for. 😉 Thanks again, and I hope you can understand!